Join us and travel East Africa's renowned game reserves and National Parks for an unforgettable Kenya and Tanzania safari! Observe huge herds roaming the Serengeti, the bird life of Lake Manyara, the “Garden of Eden” of Ngorongoro Crater, and free-ranging elephants in Amboseli and Tarangire National Parks. 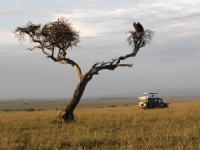 The Masai Mara, the most popular game reserve, offers fantastic all-year-round game viewing. 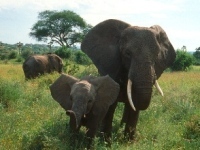 The best of Kenya and Tanzania will ensure that you will encounter Africa's Big Five in their natural environment. Round trip airfare, including all taxes and fuel surcharges, on Ethiopian Airline flights, economy class, from Washington D.C. to Nairobi and return. All transfers and visits per itinerary including entrance fees and scout fees including parks. *please note from price of $4,475 is based on land only package. Extend your East African adventure with a 3 night visit to the Spice Island of Zanzibar or 3 nights Imperial Ethiopia featuring two UNESCO World Heritage Sites. US Citizens require a passport valid for six months beyond travel dates and a Kenya and Tanzania Visa You will also require a Yellow Fever certificate when tavelling from Kenya to Tanzania. We depart our international flight from Washington D.C. non-stop to East Africa. Dinner and breakfast are served. Early morning arrival into Addis Ababa, Ethiopia for a short lay-over and continue on a short flight to Nairobi, Kenya. Meet and Greet service with transfer to the Nairobi Safari Park Hotel. Unwind with an afternoon and evening at leisure at this old colonial style hotel with beautiful gardens. DAY 14- RETURN TO WASHINGTON D.C. Early morning arrival into Washington D.C. (Dulles Airport). After your Tanzania Wildlife Safari fly south to Zanzibar Island. This was a major Indian Ocean trading center but today it appears to have been frozen in time from two centuries ago. Your resort hotel (or similar) is located just outside of Stone Town and the first class Mbweni Ruins Hotel is an excellent base for the next three nights. Hotel upgrade available at the Sea Cliff Resort. Arrive early this morning into Washington D.C. Dulles airport. After your Tanzania Safari fly from Kilimanjaro to Addis Ababa. Early evening arrival into Addis Ababa and transfer to the Jupiter Hotel (Bole). Note: This program is also available for client purchasing the Zanzibar post optional.